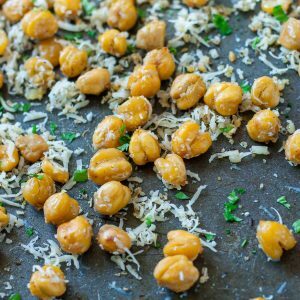 These crispy roasted parmesan chickpeas are a healthy snack loaded with protein, fiber, and a whole lot of deliciousness! Note to self: please refrain from typing up recipes while under the influence of Paul’s famous mimosas. Or should I call them man-mosas? Is that a thing? 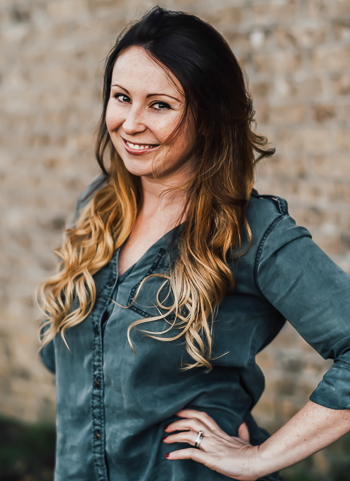 I’m barely functional today but gosh darn it you need this recipe and I intend to keep typing until it’s finished. Or at least until I fall asleep. What’s a girl have to do to get a nap around here?! Anywho! Today I’m insisting you load up a baking sheet with some buttery little chickpeas and roast them into submission, until they’re a perfect combination of crispy, chewy, soft, and nutty… AKA the most addictive legumes of my life. I always intend on topping leafy green salads with these crunchy little nuggets, but I often wind up eating the tray by the handful as a wildly addictive snack! They’re even great with soup! Especially this one. 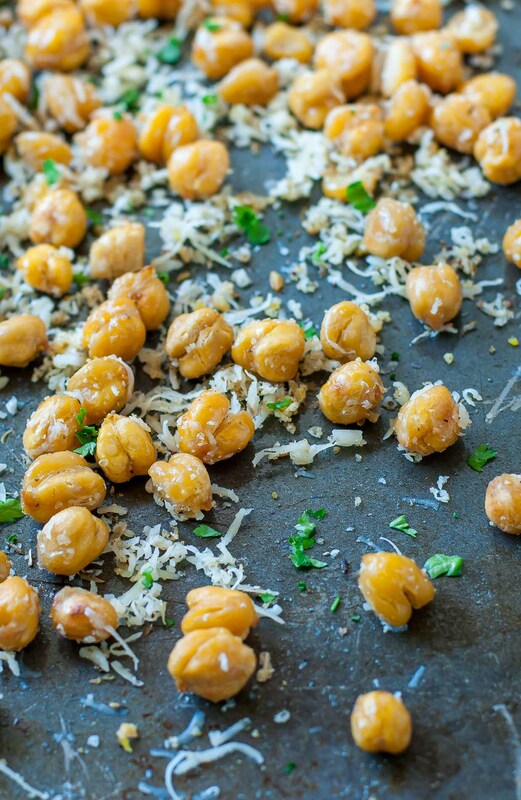 Today however, we’re tossing our chickpeas in a blend of garlic, oregano, sea salt, and lemon zest with a hearty sprinkling of parmesan cheese. It’s a tad glorious. Though the parmesan is super duper tasty, you can 110% skip it for dairy-free snackage. Pinky promise they’ll still be delicious. As a bonus, these bad boys are low-calorie, high-fiber, vegetarian, protein packed, and gloriously gluten-free. 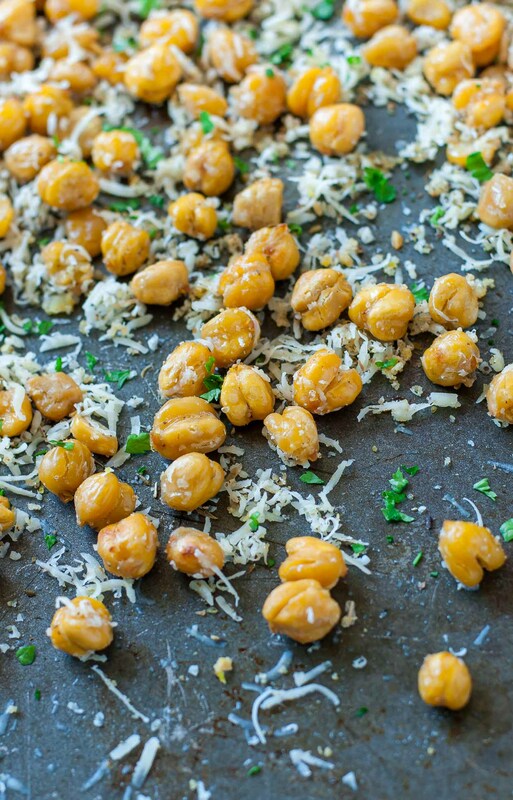 These crispity crunchity little chickpeas are amazing on pretty much everything! Serve them up on their own as a snack or sprinkle them on top of soup, salads, soup, or even on top of roasted veggies for a flavorful crunch. I like to think of them as healthy croutons! 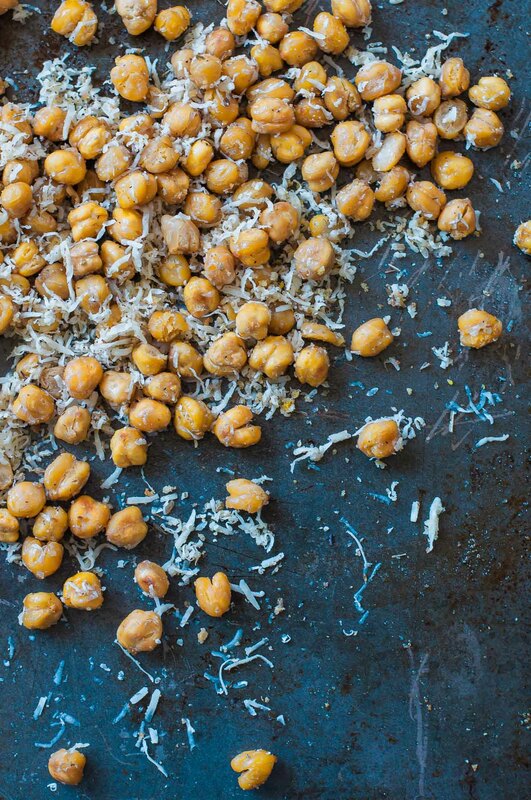 Serve while the chickpeas are still warm and crispy. Enjoy right away. As they cool the crispiness will be replaced by a nutty chewiness which I think is equally awesome. Feel free to try them both ways! Omg, I died at man-mosas! My oldest is refusing to eat pretty much all things healthy these days but he will eat these! Love this recipe! I love these! Perfect on salads! These look fabulous! Although I’m not sure they would make it into a salad before they are all gone! I did this last week for the protein portion of my buddha bowl. Ooh that sounds amazing April! Love a good Buddha bowl!